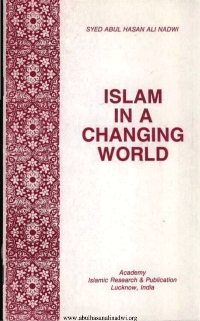 ISLAM IN A CHANGING WORLDA seminar on ISLAM IN A CHANGING WORLD was held in January 1977 under the auspices of Aligarh Muslim University’s Department of Islamic Studies in which, apart from scholars from all over the country, the Heads of the four leading Muslim institutions also participated. Lucknow, and Dr. Masud Husain Khan, Vice-Chancellor, Jamia Millia, Delhi. The inaugural address at the seminar was delivered by Maulana Syed Abul Hasan Ali Nadwi on January 22, 1977. We now feel privileged to publish the address in English for the benefit of those who prefer to read about Islam and Muslims in that language.